Mitch Albom: Building a Life and Living that Matters. Albom is the author of numerous #1 New York Times bestsellers. Tuesdays with Morrie, which spent four straight years atop the New York Times list, is now the bestselling memoir of all time. Morrie, The Five People You Meet in Heaven, For One More Day and Have a Little Faith have been made into award-winning television movies. His books have collectively sold nearly 40-million copies worldwide. 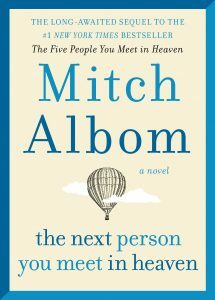 Albom’s latest book is The Next Person You Meet in Heaven. Along the way, Mitch has followed his curiosity into journalism, sports-radio broadcasting, and continues to perform as a member of a band with a crew of other well-known authors. He founded nine charities in Detroit, including the first ever 24-hour medical clinic for homeless children in America, operates an orphanage in Port-Au-Prince, Haiti, which he visits monthly and lives with his wife, Janine, in suburban Detroit. Gobble: Makes it so easy to cook fresh, delicious meals – in literally 15 minutes, with just one pan. Go to Gobble.com/GOODLIFE to get $50 off your first box. Ring: Get up to $150 off a Ring of Security Kit when you go to ring.com/GOODLIFE.